Last weekend was our Guild 3-day Retreat, and I was able to get these blocks together in rows. They were inspired by Bonnie Hunter's Tumalo Trails. 48 blocks, set 6 x 8, blocks finished 9 inches. A while back, I had started making a gazillion small 9 patches, and someone gave me an extra large plaid shirt, knowing I used them in quilts. The items were both piled on my sewing table, and suddenly it hit me, "Elaine, use that shirt with the 9-patches!" I renamed my project "Cowboy Up". Below is a small quilt made for an auction in about 10 days. I machine quilted an overall ribbon, covering the quilt 2 times with 2 different threads. Hint - if you do this with 2 different threads, be sure and quilt with the darkest one first - a light thread first (in this case) made it difficult to follow with the second stitches! I'm pleased with the end result (not shown in the photo). This was the first time I purchased a coordinated set of charms - oh my, that made fabric choices so easy! I added a few charms of my own, given or won from other Guild members. This little quilt is about 40 x 44 in. 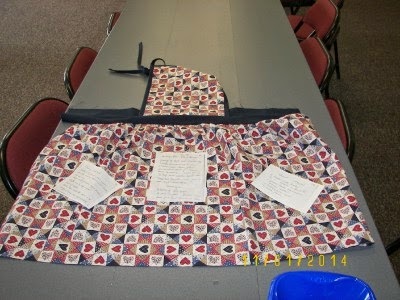 Below is a clever apron idea by Tina, a friend and Guild member who was also at the Retreat. Those light patches are family recipes, now printed on fabric - what a great idea. The handwriting is clear, and even the fingerprint smudges from the recipe cards are included on the patches. She's making several for family members, who might even recognize their own fingerprint smudges on family favorite recipes! Love your "Cowboy Up" quilt. Makes me want to get out the shirts and play!! 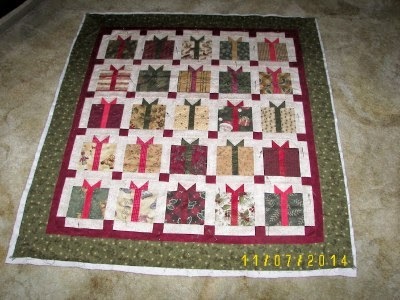 I just had out my version of that "Flurry" packages quilt, wondering if I could get mine quilted for the holidays. I like your fabric choices,from what I can see. Clever idea on the apron. Do you know what method she used to transfer the recipes so they will stand up to all the washing an apron needs? Oh Elaine, these are really nice! I love that "Cowboy Up" design and your choice of colors. Be sure to post the finish! I love the 9-patch quilt - that's a great way to put the blocks together. The Christmas package quilt is so cute! It should bring in some $$ in the auction. The recipes on the aprons is such a cute idea! I would never have thought of that. LOVE your 9-patch quilt! Cute presents too. And what fun to print recipes on fabric! My mom had such beautiful handwriting that I thought it would be cool to frame a few of her recipe cards. Boy, that extra plaid diagonal strip in there really sets off the ninepatches. And I LOVE that Christmas quilt. I really don't need to make any more Christmas stuff but yours in tempting! Wow!!! I love the Tumelo Trails ... or Cowboy up! What a great name!! !